Over the years I have painted a lot of kitchens. These Pictures of hand-painted kitchens are some examples to give an idea of the possibilities. 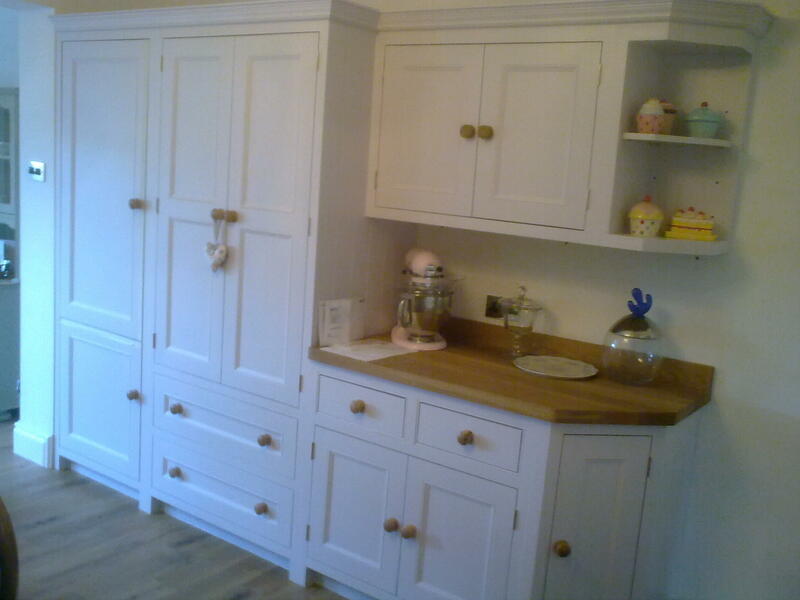 Neville & Johnson made top quality wooden kitchens before specialising in exclusive fitted furniture. 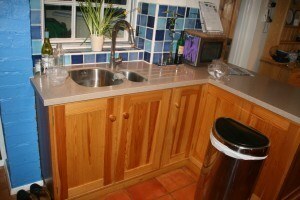 This lacquered limed oak kitchen had been going strong for 15 years, but visually, it was dated. 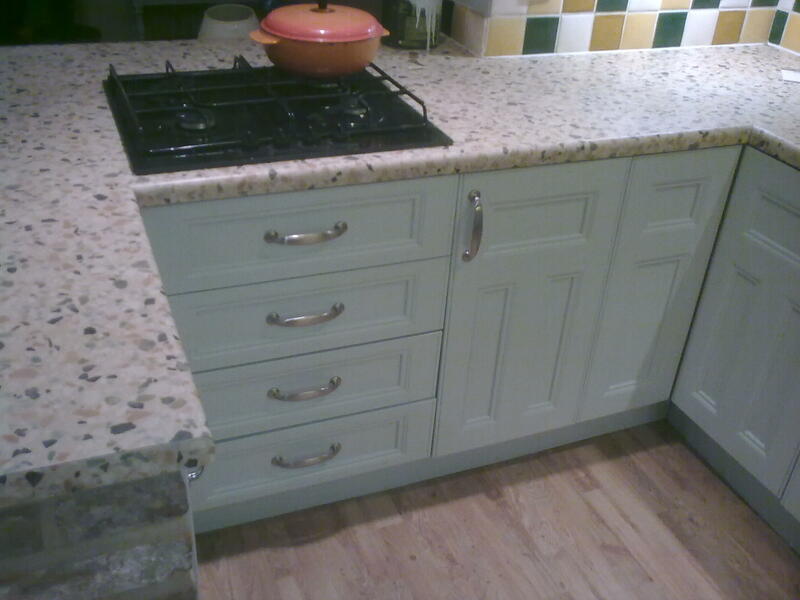 It was a choice between a new kitchen for £10’s of thousands, or refurbish with a hand-painted finish for under £3000. 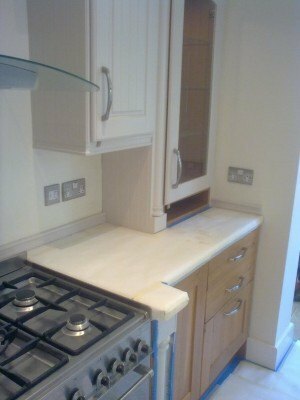 Completed with new handles and some new granite upstands, colour advice yet again from Lilou Interiors, the homeowners were absolutely delighted. 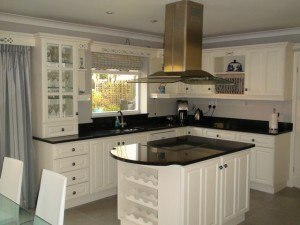 This is another spectacular refurbishment of a substantial custom-made Poggenpohl oak kitchen. It worked well from a practical point of view, but aesthetically, had become dated. 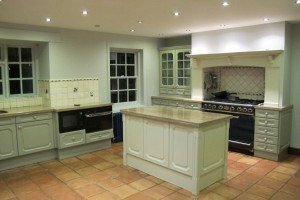 After thorough preparation and painting, plus new knobs and a professionally designed colour scheme, the owners feel they now have a brand new kitchen for a fraction of the full price of new. 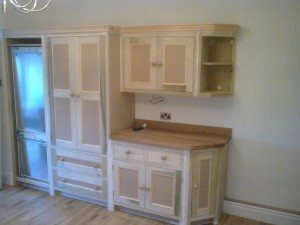 These cabinets were constructed with poplar frames and MDF panels and an oak veneered mdf carcass. I prepared, filled and painted the kitchen with 2 coats of oil primer and finished with 2 coats of oil-based eggshell, rubbed down between coats. 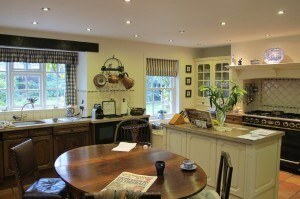 The 2-tone colours were matched exactly to F&B samples and with oiled oak worktops and the refurbished Aga, it looked fab. 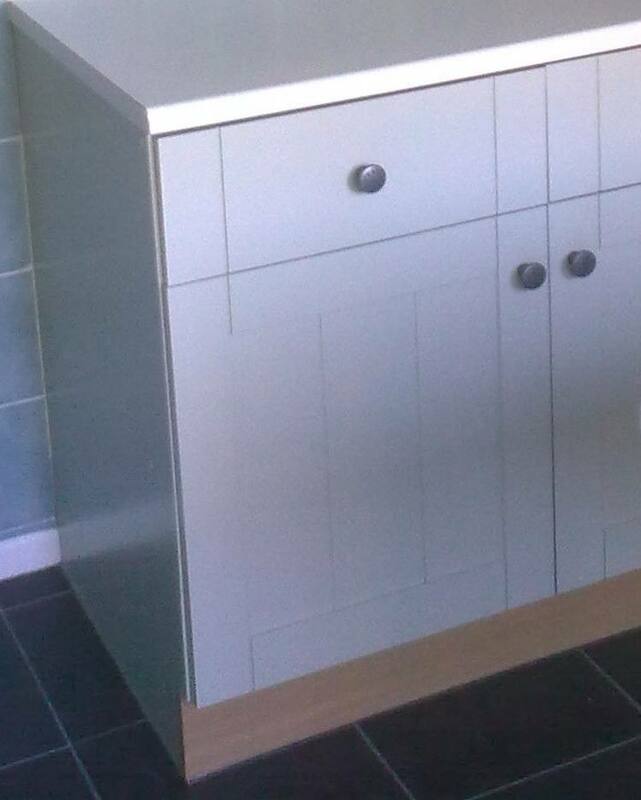 The high quality “orange” pine units had a clear lacquer finish, which I prepared, primed with high adhesion oil primer and finished with 2 coats of Little Greene oil eggshell – “Salix”. 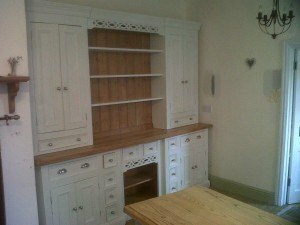 I matched an impressive Welsh dresser to the main kitchen, to complete the transformation. New Heatherington Newman custom made timber inframe kitchen. 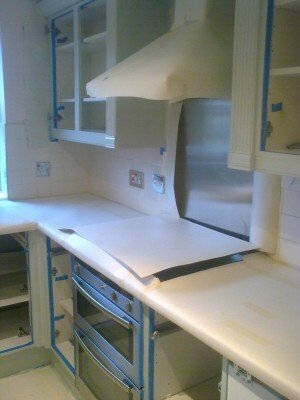 This high end kitchen came pre-primed. I sanded it, undercoated and finished with 2 coats of Little Greene oil based eggshell. 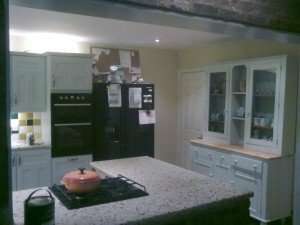 The 2 different shades of blue were colour-matched exactly to F&B sample colours, and set off the refurbished Aga and quartz tops a treat. 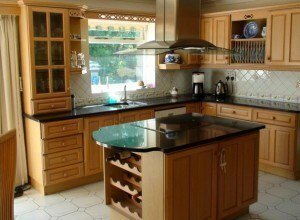 In terms of layout, this kitchen worked perfectly for the homeowners, but in terms of appearance, it was 16 years out of date. 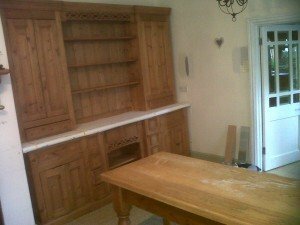 It was brought into the modern era with some TLC from our joiner and all-round refurbishment expert, Steve Evans. Then I thoroughly prepared the units and frames with a high adhesion bonder coat and finished with oil based eggshell – Aquamarine. The ceiling was bare pine T&G. To be honest, this project was one of the most satisfying upgrades I have done. 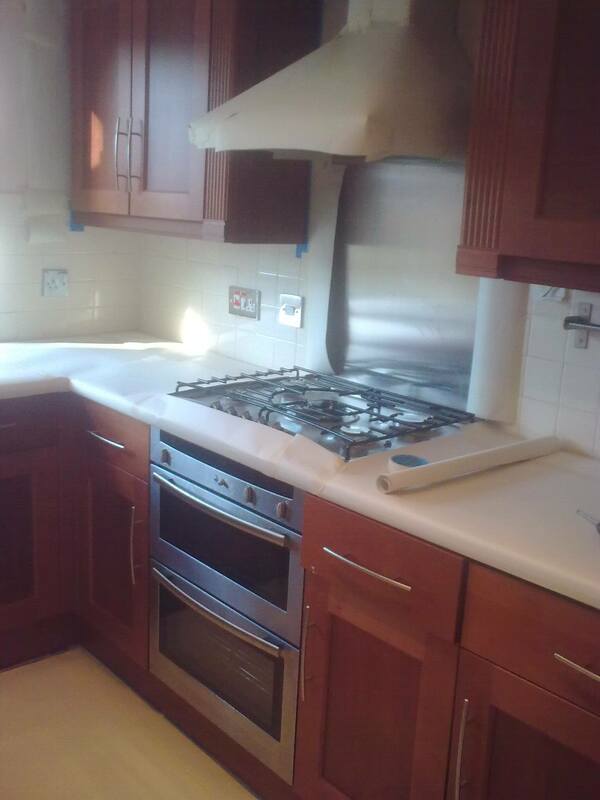 The kitchen was well made and practical, but it was aesthetically tired. 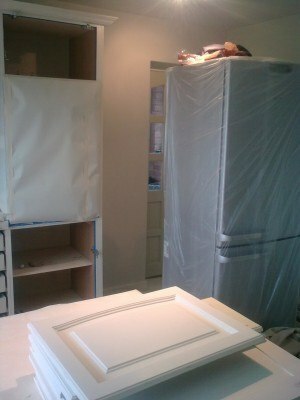 I prepared, primed then applied one oil undercoat and 2 coats of oil eggshell – Little Greene “Salix”. According to the neighbours, it was surely a new kitchen? 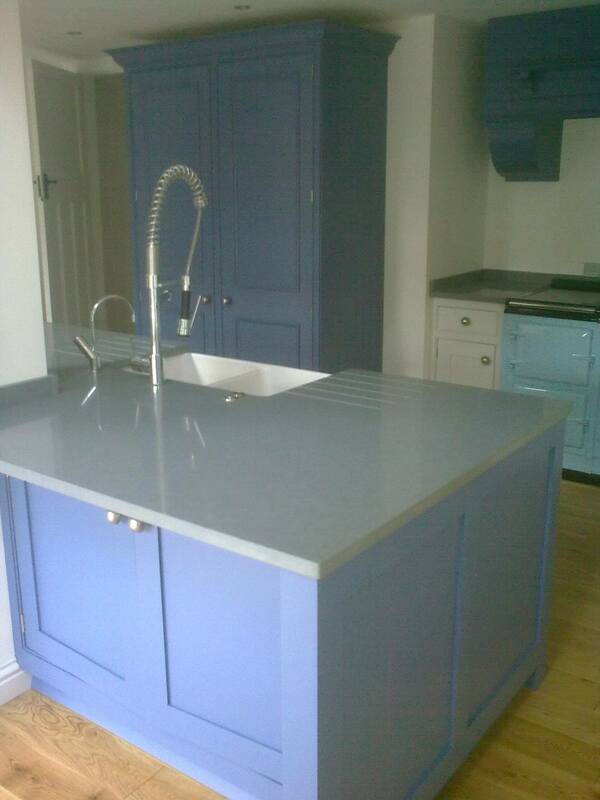 A large but gloomy dark kitchen was completely transformed with Little Greene “Acorn” oil eggshell paint. 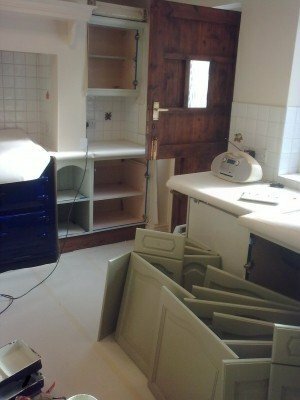 The plan was to have the kitchen painted as an interim measure while the plans were drawn up for a major new extension. I think they were so thrilled with the work, some plans may not be as urgent as first thought. 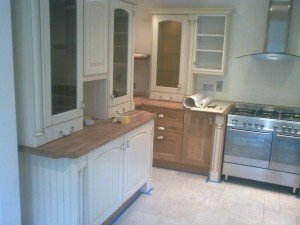 This was a beautifully fitted kitchen with a mix of natural wood and paint. It worked perfectly and the layout was so practical but the look of the painted areas was dated and to be honest, the distressed finish hadn’t been very well done. 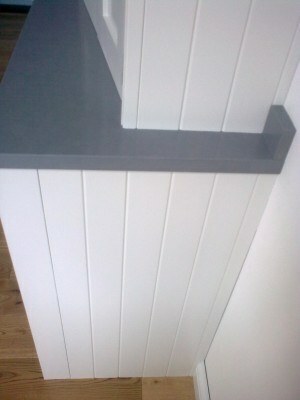 I put that right, the paintwork was prepared, primed and finished with “Rolling Fog mid” oil eggshell from Little Greene. 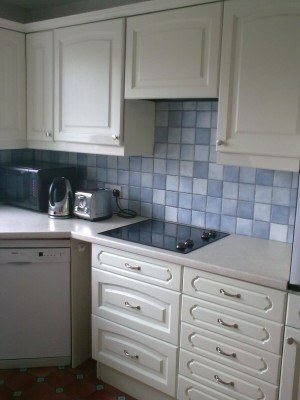 Apparently a local estate agent in Prestbury said it was the best hand-painted kitchen finish they had ever seen. 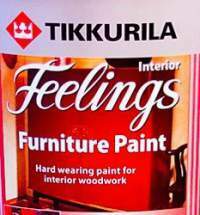 This was when Farrow and Ball did traditional oil based paint. The eggshell was reliable. I don’t use the modern eco Farrow and Ball eggshell now, though, if I can possibly help it. The full story behind this Annie Sloan chalk paint kitchen project. Annie Sloan herself commented on this. My approach to waxing and buffing is quite different to what you normally hear or see from girl chalk painters! 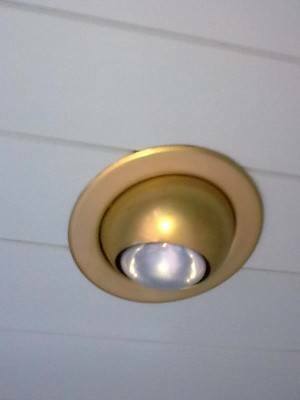 hello, I would like my kitchen re-painted or repaired, it was hand painted originally when I bought it about 8 years ago, but have marks here and there and its really not a good look. 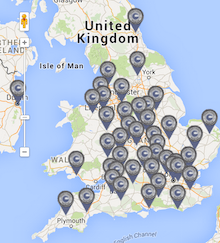 do you travel to sittingbourne in kent please? Hi, I have a 16 year old John Lewis of Hungerford, Artisan kitchen. There are chips and marks on some of the doors. 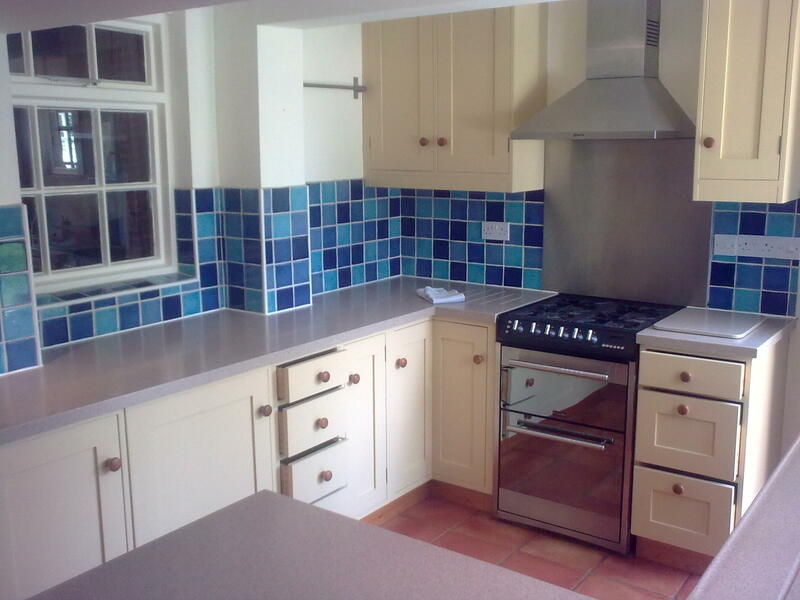 Do you hand-paint kitchens in Carmarthenshire? Do you paint the inside of the doors , or is this classed as an extra ? Paint both sides of doors should come as standard. 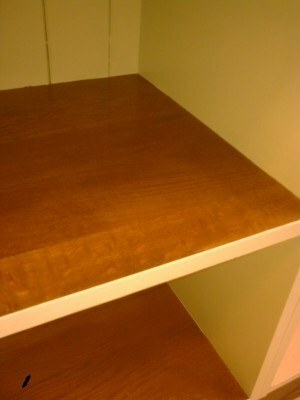 With racking it is a straightforward process to paint both sides.